Timeless and effortless beauty; Maggie Sottero Rachelle will quickly become your fairy tale wedding gown. This elegant bridal gown with delicate lace appliques features a lightly shaped neckline that is ideal for most bust sizes. For optimal comfort and support, detachable lace cap sleeves are sold separately for those who desire. The feminine fit and flare silhouette softly hugs to the curves of your body while elegantly draping out at the knees for a flattering hourglass silhouette. Delicate lace patterns are accented with shimmering beaded embellishments through the gown for added interest and appreciated detail. The back of this mesmerizing gown is complete with a low open back, perfect for showcasing on trend back jewelry. Finished with covered buttons over the zipper and inner elastic closure, this dress is sure to give you a pleasing and optimal fit you will appreciate. " This dress has been worn once to an indoor wedding in the fall, accessorized by a belt and veil, for approximately 4 hours. Minor alterations have been made to this dress. 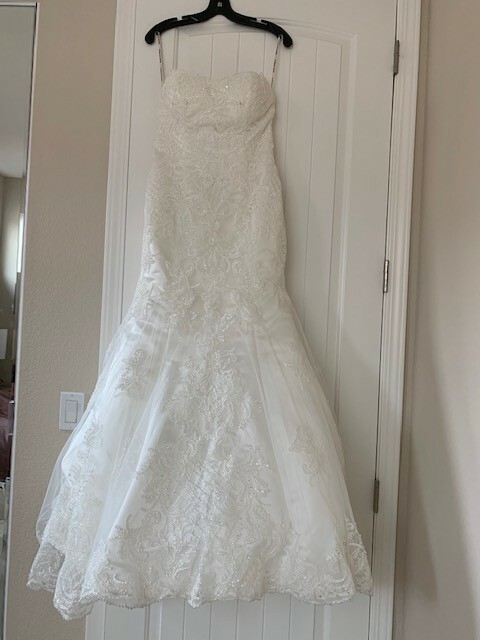 It has been professionally cleaned, stored in a cool closet since the wedding in it's original dust bag, and is ready to walk down the aisle with a lovely bride. Will include a New mid length Veil that was never worn. Minor alternation to the bust and hip area, including a bustle. Once you send a message, Macy can invite you to purchase the dress.